The Northeast Mississippi Community College cheerleading program is looking to renew its roster after setting a school record with 20 total members during what has been a successful 2018-19 sports season. Northeast will hold an open cheer tryout for the 2019-20 academic year on Wednesday, April 3. The session is scheduled to begin at 3 p.m. inside legendary Bonner Arnold Coliseum. All candidates must either be eligible for admission or currently enrolled at Northeast prior to the tryout date. They are also required to submit a letter of recommendation from a prior coach or high school principal as well. Advanced tumbling skills are highly preferred. A back handspring is also encouraged because it is part of the routine for Northeast’s “Tiger Rag” fight song that is frequently played at each home contest. Athletes are judged based upon their performance in several categories, including tumbling, toe touch, jump sequences, stunts and cheer. All ladies must be prepared to exhibit a stunt sequence with at least one transition plus spinning variations. To register, visit www.nemccathletics.com and completely fill out the application that is available to print. This includes a release of liability form, which must be brought along with the application to the tryout. Auditions for the position of Spirit the Tiger mascot are set for the same afternoon as the cheer tryouts. Spirit the Tiger is a fan favorite around the Booneville campus, especially with the many children that attend Northeast sporting events. Applicants for Spirit the Tiger must meet all of the same requirements as those that are trying out for a spot on the cheer squad. They must also complete a short skit or dance that lasts between one-and-two minutes that features any props necessary, including signs or pom-poms, to gain crowd support. Northeast will host a clinic to help go over the various drills, maneuvers and stunt groups that are part of the tryout on Tuesday, April 2 beginning at 4 p.m. in the City of Hospitality. An open gym is also on the docket to help prepare those that are interested in joining the team at 4 p.m. on Monday, April 1. Attendance at these events leading up to the tryout is mandatory. Northeast’s cheerleaders are non-competitive and focus on supporting the basketball and football programs on game days and at pep rallies. All those that qualify for the team earn scholarships for the fall and spring semesters. 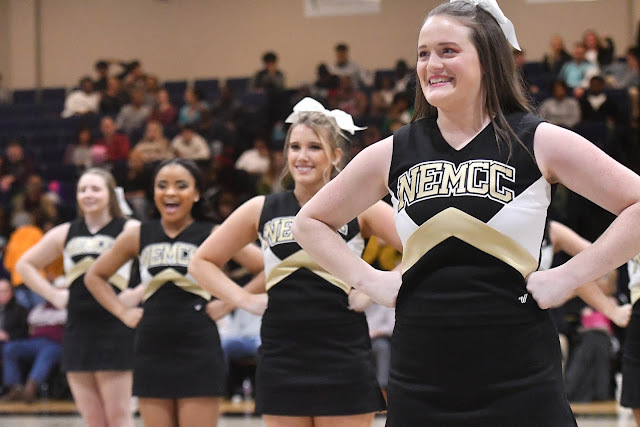 For more information about tryouts for the Northeast cheerleading program and its annual clinic, contact head coach Chasity Moore at 662-720-7189 or by email at cgmoore@nemcc.edu. CUTLINE – Northeast Mississippi Community College sophomore cheerleader Shelby Smith prepares for an upcoming cheer during the final home basketball game of the season against East Mississippi Community College on Thursday, February 21. Northeast’s cheerleading program has set its tryouts for the 2019-20 academic year for Wednesday, April 3 inside Bonner Arnold Coliseum.